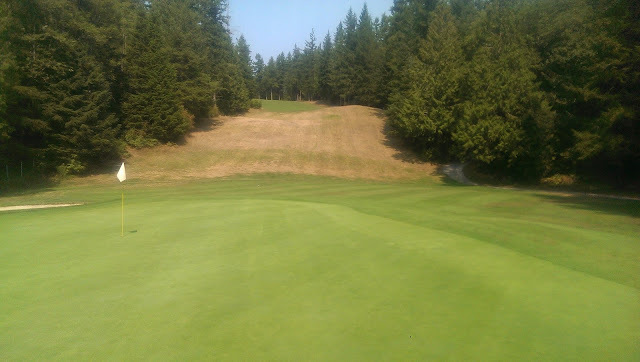 Something that I have always taken for granted at the Pender Harbour Golf Club is the fact that I can easily see what the overall disease pressure is on my turf. Due to the cost and the environmental conditions at our course we only have to apply pesticides to our putting green surfaces. This leaves the rest of my course as a "control" plot. Fusarium on the tees shows me that it is active. I can easily see when the other areas are being infected with disease or other pests. I can then take this information and use it to plan my pesticide applications on my putting greens. When pesticides are applied to my putting greens it becomes impossible for me to see what the true pest pressure is because all of the pest is suppressed by the pesticide. I had the pleasure of hearing Jeff Carlson of Martha's Vineyard Golf Club speak at this year's WCTA conference. For those of you who don't know, Martha's Vineyard is one of a few courses that is completely organic but still maintains comparable conditions to most "non organic" golf courses. He showed us how he has a control green at his course that shows him the benefits of the cultural practices that they perform. He can easily see the benefits that rolling, dew whipping, and any of the organic pesticides he is able to use. It really helps him gain perspective and justify the huge amount of work that it takes to manage turfgrass without synthetic chemicals. This winter I have talked with a few turf managers about how they leave areas of the course without pesticides to see how the conditions differ. This is a fantastic idea and allows the managers of these areas to see the benefits of their pesticide use. It is also a great tool to show the public or membership what would happen if pesticides were not used or banned. It could also tell the turf manager that pesticides might not be needed. It can really help us learn about how our management practices affect the turf. Another idea that has been thrown around is the "sheet of plywood" method where a sheet of plywood is placed on the turf before a product is applied to see the differences that result. The area covered with the plywood does not receive the application so it allows the turf manager to evaluate the benefits of the applied product. Fusarium mycelium in winter. This disease is definitely active! Either way it is good to have a control area on your course so that you can see the benefits of your management practices. It will help you make better decisions based on results. It will also help you show the membership/public that what you are doing is justified.